Thank you for your interest in Holland Custom Concrete. We serve Dallas Fort Worth metroplex. with honesty, integrity, experience and style. We specialize in custom flooring including stained concrete, concrete flooring, decorative concrete, concrete staining in DFW in Dallas, Rockwall, Highland Park, University Park, Richardson, Plano, Mckinney, Allen, Frisco, Addison, Prosper, The Colony, Irving, Coppell, Little Elm, Cedar Hill, Desoto, Glen Rose, Ovilla, Red Oak, Lakewood, Lewisville, Denton, Rowlette, Royce City, Garland, Mesquite, Grapevine, Colleyville, Southlake, Westlake, Heath, Wylie, Sachse, Lavon, Anna, Fairview, Las Colinas, Aledo, Fort Worth, Arlington, more. We do both interior and exterior work for commercial and residential locations. You will experience nothing but complete satisfaction when you choose Holland Custom Concrete for your next project. With 3 generations of knowledge and experience we have the solution to any of your Stained Concrete Flooring and all other flooring needs. 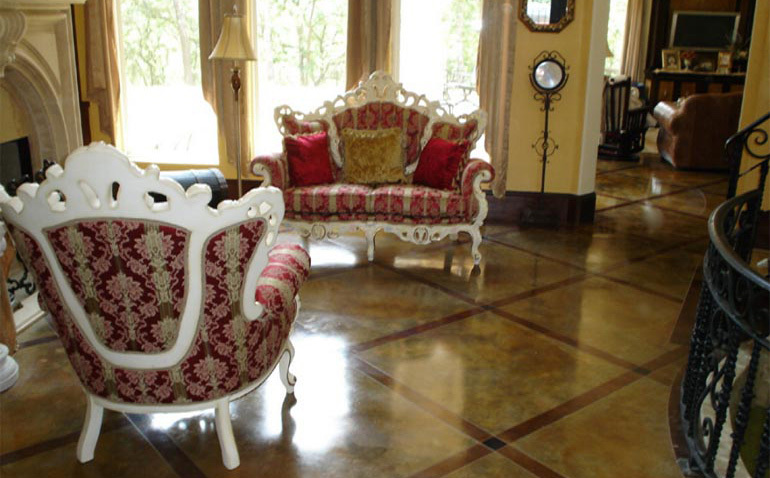 Concrete Staining can be made to look like marble, granite, or stone. Your home will be transformed into a work of art, and that's what our concrete and our other luxury flooring is...an art form performed by truly talented artists. We would love to come by your home or place of business and give you a FREE ESTIMATE and show you: concrete stains, tile and wood samples.